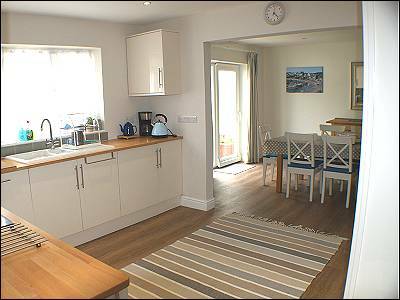 Driftwood, New Quay - pet friendly cottage sleeping 8+ with Wi-Fi. 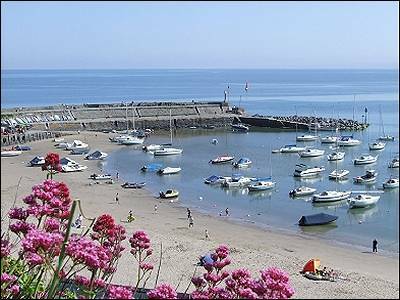 Driftwood is a newly renovated 5 bedroom, 4 bathroom family holiday house sleeping up to nine in five bedrooms, with parking for 3/4 cars, a few minutes walk to New Quay. 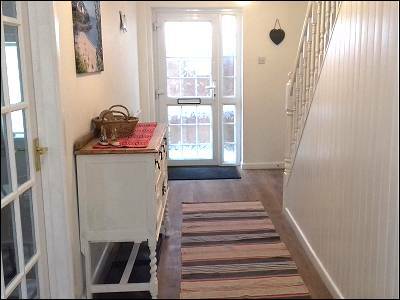 With an enormous sitting room, spacious kitchen and dining room, with fully enclosed back garden, this house is ideal for family holidays and celebrations. Short breaks available low season. Wi-Fi provided and one well behaved dog welcomed. Weekly bookings from Sundays. 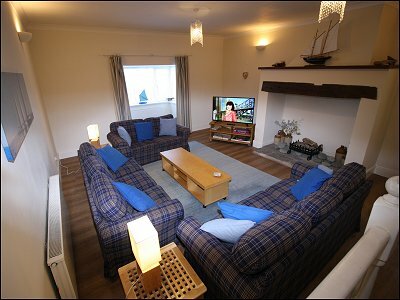 Accommodation: There is an enormous ground floor sitting room with sofas and chairs and 50" flat screen TV. A newly fitted kitchen with built in oven and dishwasher, large induction hob with extractor over, plenty of crockery, glassware, cutlery and cookware to cater for family meals and celebrations. 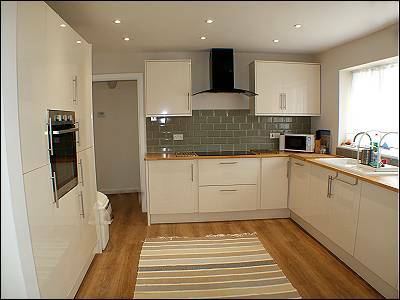 Adjacent to the the kitchen there is a utility room with fridge /freezer, washing machine and a second microwave. The spacious dining room, with sliding door opening onto the patio area, has a large dining table with seating for 8, plus 2 high chairs and booster seat. Downstairs cloakroom with WC and basin. Upstairs there are 5 bedrooms : The front bedrooms 1, 2 and 3 all have sea views and you can often see as far as the mountains of Snowdonia. See photo at top of page. 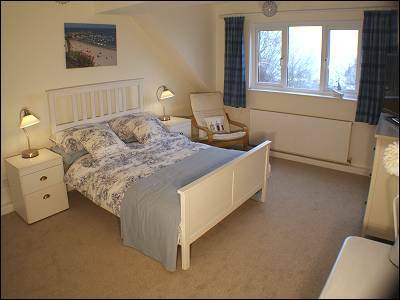 Bedroom 1- with sea views, double bed, storage space, 40 inch flat screen TV, en-suite with bath, shower, WC and basin. 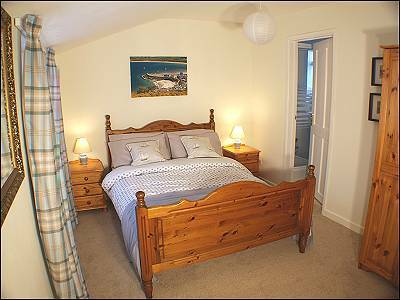 Bedroom 2 - with sea views, children's room with a cot, toddler bed, and travel cot, changing table and comfy chair. Selection of toys and children's books. 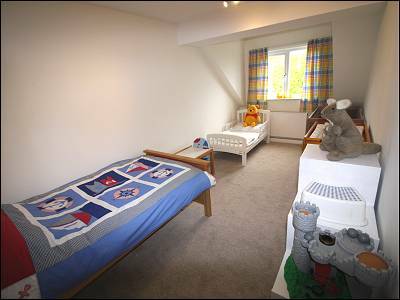 The cot or toddler bed or travel cot can be moved to another bedroom if required. Bedroom 3 - with sea views, twin room. 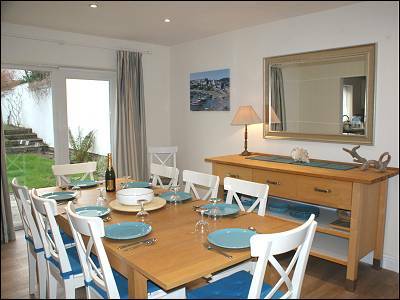 two single beds with storage space and newly fitted en-suite with shower, WC and basin. TV. Bedroom 4 - facing the back garden, with double bed, storage space, 32 inch flat screen TV, and en-suite shower, WC and basin. Bedroom 5 - facing the back garden with twin beds, TV and storage space. Also upstairs there is a family bathroom adjacent to bedroom 1 with bath, shower over, WC and basin. There is full central heating with radiators in all rooms. 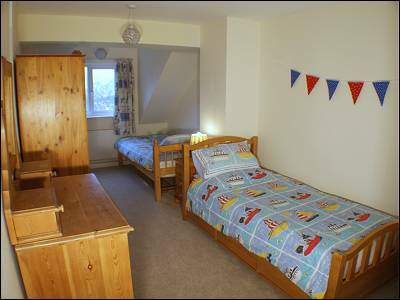 For Children - Two twin bedrooms with 3' single beds, and a bedroom with one toddler bed, full size cot and a travel cot, one bed guard to fit on any bed. Two high chairs and a booster seat. Family beach box with crab buckets, crab lines, and sand toys, Lindam door gate, baby changing unit in bedroom 2. Parking: private off road parking for three/four cars in front of the house. 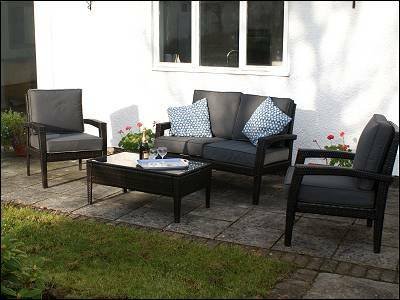 Outside: There is a very sheltered and private patio behind the house with outside furniture seating 8, charcoal barbecue and steps up to a grass area beyond with rotary drier. 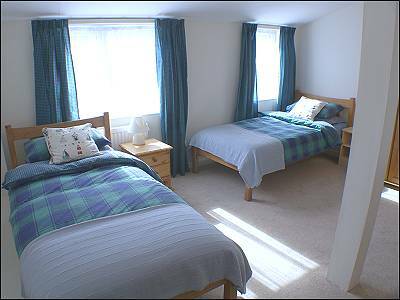 Linen: Bed linen is optional and can be provided at £10 per double bed and £5 per single bed if requested. Towels are not provided. Electricity and central heating - no extra charge. Radiators throughout. 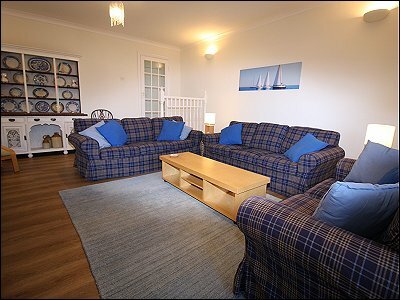 Short breaks available by arrangement Mon. to Fri. 4 nights or Fri. to Mon.3 nights. Prices are shown on the availability section below. There is a refundable £50 security / breakages / extra cleaning deposit, to be paid with final payment. Restrictions: one dog only and must be kept downstairs and off the furniture. A BabyDan removable pet gate is provided for the bottom of the stairs. Strictly no smoking inside the house please. 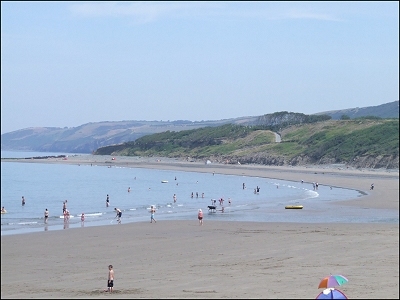 Across the road is the entrance to the Quay Holiday Park where guests can buy day passes to use the many facilities including the various pools. 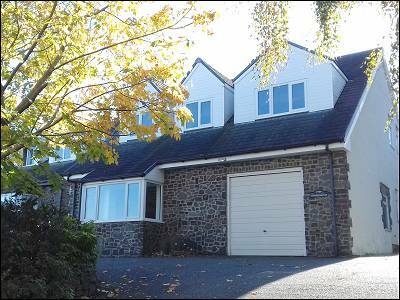 Bus Service - This property is conveniently located for guests using public transport as there is a bus stop ( T5 hourly service from New Quay to Aberystwyth or Cardigan ) close to the house. Buses T1 and T5 are currently free to everyone on Saturdays and Sundays throughout the year. Access: A car can be brought close to the front door of the house. There is a ramp to the front door. The ground floor is level throughout with wood laminate floor, except the sitting room which is down 3 steps. The stairs and all bedrooms are carpeted, bath/shower rooms are all tiled. All bedrooms are upstairs, plus downstairs WC and basin. Full oil central heating and double glazing throughout. The garden and paved terrace behind the house is fully enclosed. 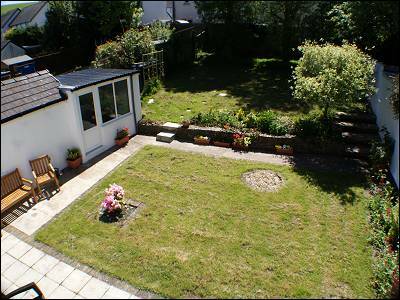 There are 4 steps up to the furthest garden area. There are no specific adaptations for disabled use. 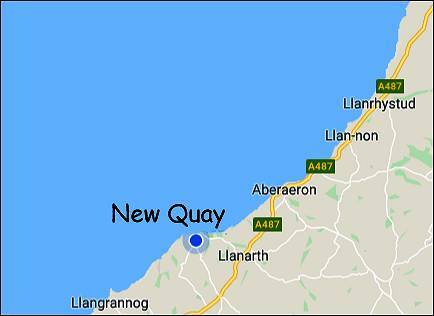 Coastal Path: The new Ceredigion All Wales Coastal Footpath can be accessed below the holiday park which is opposite the house. You can walk into New Quay along the beach at low tide. You can pay this by PayPal or card. The balance will be due 6 weeks before the holiday.